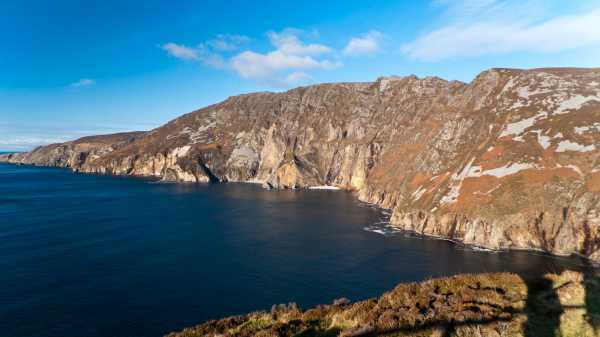 Due to the popularity of the cliff walk to Slieve League there are problems of path erosion and the small capacity of the car park at Bunglas. These issues have been addressed by the building of a new lower car park and the request that walkers follow the route in a clockwise circuit from the lower car park and return via the Pilgrim's Path. The recommended route to Slieve League starts at the lower car park at G57130 75560 A. From here follow the road for 1.5km to the upper car park at G55834 75690 B. In winter it might be possible to park here. The path from the upper car park leads along the top of the cliffs to Cnoc Ramhar. On the next section of the route there is a sharp 100m long rock arête at G5565 77553. Some writers have called this arete the One Man's Path. The arête can be climbed but should be treated with caution in wind or wet conditions. A rope would be advisable for the inexperienced as there is 450m drop on the left. Alternatively there is a by-pass along a path to the right. The final section of the route leads via a large plateau and then to a narrow section (known as One Man's Pass) to the summit of Slieve League.